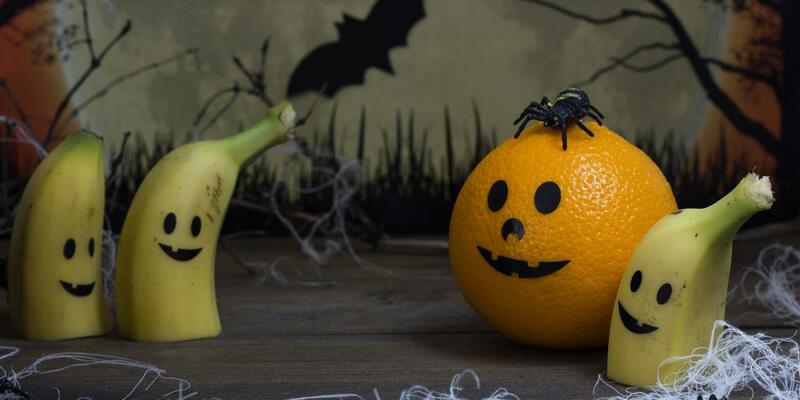 No tricks — just enjoy this healthy treat! Coconut and banana can help boost your immune system. This recipe is fun for the whole family! Peel bananas and cut in half crosswise. Gently insert a popsicle stick into the center of the flat round end of each banana half. Place bananas on a cookie sheet in the freezer for 1 to 2 hours. Meanwhile, pulse coconut in a blender or food processor until it is fine. Set coconut aside on a wide shallow plate. Remove bananas from freezer. Dip each banana in yogurt until it is lightly covered. Sprinkle coconut evenly over each banana. Gently but firmly press raisins, chocolate chips, and/or dried cranberries firmly into each “ghost” to make their eyes and mouth. If ghost pops won’t be eaten immediately, place them on a cookie sheet in the freezer, so they won’t turn mushy. Pops can also be eaten frozen.